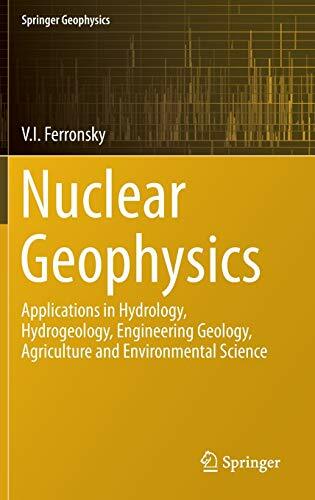 [PDF] Nuclear Geophysics: Applications in Hydrology, Hydrogeology, Engineering Geology, Agriculture and Environmental Science | Free eBooks Download - EBOOKEE! Description: The fundamentals of methods in nuclear geophysics and their practical applications in engineering geology, hydrology, hydrogeology, agriculture and environmental science are discussed in this book. The methods and apparatus based on absorption and scattering of gamma and neutron radiation for determination of density and soil moisture in natural conditions are presented in Chapters 2, 3, and 4. The theoretical fundamentals and installations of the penetration logging techniques where gamma, gamma-gamma and neutron logging in combination with static penetration form common complexes for engineering geology and hydrogeology exploration without boring holes are described. The developed constructions and practical use penetration logging installations for applications on land and marine shelves are described in Chapters 5, 6, 7, and 8. The physical fundamentals for the use of the natural stable and radioactive isotopes for study of the global hydrological cycle are provided. The experimental data, origin and distribution of cosmogenic and radiogenic isotopes in the oceans, atmospheric moisture, surface and underground waters are presented in Chapters 9, 10, and 11. The sources and conditions of the radioactive contamination of the natural waters are discussed in Chapters 12 and 13. This book will be of interest to scientists and researchers who use nuclear geophysics methods in engineering geology, hydrology, hydrogeology and hydrogeoecology. Lecturers, students, and postgraduates in these subjects will also find it useful. No comments for "[PDF] Nuclear Geophysics: Applications in Hydrology, Hydrogeology, Engineering Geology, Agriculture and Environmental Science".